Islam News Room - Which Group is Saved Sect of Islam? Which Group is Saved Sect of Islam? IMPORTANT: Some websites have taken parts of our articles and added to and subtracted from our statements. We are not responsible for anything published outside of our websites. 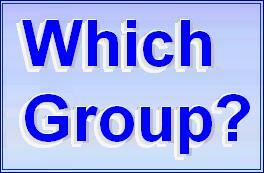 "It is He (Allah) who has named you MUSLIMS.."
"Which Group is the Right Group?" Seems like these days the Muslims now come in "All Flavors." There are so many different names of so many groups in the world today. But which are the "true Muslims?" Sunnies, Salafies, Shi'ites, Ahmadiyah, Kadianis Sufis, Nation of Islam, Hanafi, Shafi, Wahabi, Moorish Science, Five Percenters, Aghakhanis, Ansar Allah, Modernists, Reformed Muslims - etc. So many sects and groups - all claim to be the "saved sect of Islam"
- But which one is the real Islam? NOTE: With all respect to those who ascribe themselves to various groups in Islam, this article is dedicated to solving serious issues effecting Muslims world wide. The conclusion is that anyone who can say, "I believe there is only one God, Allah and Muhammad is His messenger and servant" is in fact, a Muslim. It is only when they insist on adding an adjective to describe their particular "type" of Islam that the problems begin to surface. Each of the "faith groups" mentioned have been labeled by different people as sects or deviant groups in degrees from border line to completely out of Islam. Before we begin trying to gain an understanding of who is right or wrong on this issue it is quite advantageous to spend a moment in reviewing the meanings of the actual words which will be using in our discussion. We begin by looking to the meanings of key words from the Arabic language as this will assist us in making the right conclusions and avoid more confusion. The first of all the words to understand has to be "Islam" and then immediately following that, the word "Muslim." These words are not English and have to be understood in the Arabic. They do not translate into one word. First word - "ISLAM." We should have been asking all along, "What does the term ISLAM actually mean, anyway?" Surrender "Give up evil and lusts - give in to the Creator"
Submission "Agree to the terms and conditions of being a servant of Almighty God"
Obedience "Comply with His Commandments to the best of your ability"
Sincerity "Do it all whether or not anyone else notices or cares." Peace "Accept what Almighty God gives you in this life in serenity." All of which come about only by giving up the Free Will of the nafs (self or ego) in favor of the Will of the Creator and Sustainer of All That Exists (ALLAH). ISLAM is mention in the Quran as a "deen" or way of life of an individual. A complete way of living in balance with everything else in the creation of Almighty Allah. ISLAM provides inclusive instructions for everything including eating, sleeping, dealing in relationships, economics, politics, health, worship and even death. The entire universe is "IN ISLAM" because it is all a part of what has been created and is being sustained by Almighty Allah. Now let us consider the next logical question; "What does the term "Muslim" actually mean?" Again, we must keep in mind that it is an Arabic word and is of course subject to the rules of the Arabic language. Actually, it is derived from the word ISLAM. Whereas, you might think of ISLAM as the verb or action and MUSLIM as the noun, or the one performing the action. In English whenever we have a noun performing a verb, we add the two suffix letters; ER. But in the Arabic language many times you will find that the prefix letters of MU are used for the same purpose. A "MUSLIM" is one who follows or practices the action of "ISLAM"
In English, when we understand the "ISLAM" is an action, we might say that anyone who "Islams" is an "Islam-ER." Right? We see in the chart above, in Arabic the "mu" preceding a verb indicates the same thing. Therefore, we would understand that the one who is actively doing the verb of "Islam" [submission to God] is a "Mu"-Islam or "Muslim." Now, we should ask, "How does a person become a MUSLIM?" Only when a person is willing to submit to the Commandments of the Higher Authority from Above, meaning to obey Allah on His terms as much as possible does he/she become a " MUSLIM." Allah Says in Quran, all of creation is in submission to Him (MUSLIM). What if the sun asked the moon, "Hey moon! What kind of Muslim are you? A Shia' or a Sunni?" - Such an idea just does not make any sense. And fortunately there are several clear evidences for us to determine the correct solution to this problem. The first evidence to mention in Islam is the actual teachings of the faith are preserved in their original language and texts. Allah sent down the Quran (Recitation) to the Prophet Muhammad, peace be upon him, in the Arabic language, through the angel Gabriel, who memorized it and taught it to his companions who also memorized it and then passed on this tradition from generation to generation, to us today. The Quran is the same in every single mosque on earth and no one has ever changed a single word of it in 1,400 years. The second evidence is the authenticity of references known as Hadeeth [verified teachings of Muhammad, peace be upon him] the teachings of Muhammad, peace be upon him, are also available to us today and have been preserved by his followers and passed on along with the chain of narrators to insure the reliability and authenticity of each one. The third point, Islam provides a totally complete and balanced way of life for all of the creation of the Almighty. Islam comes as more than just another faith or religion. Islam offers a path to the unity of all people and provides for them instructions from the Almighty Above in how to solve all of their problems and differences. Let us now look to the actual teachings of these two Holy Sources [i.e. ; Quran and Hadeeth] to learn what Islam teaches about the subject of dividing up into various groups or sects. As we have already established, Islam is based on two evidences: 1.) The Quran; and 2.) Sunnah (The Prophet Muhammad, peace be upon him]. "And how would you disbelieve, while unto you are recited the Verses of Allah, and among you is His Messenger (Muhammad SAW)? And whoever holds firmly to Allah, (i.e. follows Islam Allah's Religion, and obeys all that Allah has ordered, practically), then he is indeed guided to a Right Path. And hold fast, all of you together, to the Rope of Allah (i.e. this Qur'an), and be not divided among yourselves, and remember Allah's Favor on you, for you were enemies one to another but He joined your hearts together, so that, by His Grace, you became brethren (in Islamic Faith), and you were on the brink of a pit of Fire, and He saved you from it. Thus Allah makes His Ayat (proofs, evidences, verses, lessons, signs, revelations, etc.,) clear to you, that you may be guided. "Do the words; 'Islam' and 'Muslim' appear in the scripture of Islam [Quran]?" Answer: YES! "Remember, one day you will appear before Allah and answer for your deeds. So beware, do not stray from the path of righteousness after I am gone. People, no prophet or apostle will come after me and no new faith will be born. Reason well therefore, O people, and understand words which I convey to you. I leave behind me two things, the Quran and the Sunnah (Hadith), and if you follow these you will never go astray." "Muslims will divide into 73 groups. All will be in Hell, except one. The one me and my companions are on today." That is the universal group of Islam leading life based on Quran and Sunnah. Prophet may peace and blessing of Allah be upon him never said that he was a salafi or sunnie or shiite and we are suppose to do what our prophet (saw) did which is Call us Muslims and Muslims only. 'Both legal and illegal things are evident but in between them there are doubtful (suspicious) things and most of the people have no knowledge about them. So whoever saves himself from these suspicious things saves his religion and his honor. And whoever indulges in these suspicious things is like a shepherd who grazes (his animals) near the Hima (private pasture) of someone else and at any moment he is liable to get in it. (O people!) Beware! Every king has a Hima and the Hima of Allah on the earth is His illegal (forbidden) things. Beware! There is a piece of flesh in the body if it becomes good (reformed) the whole body becomes good but if it gets spoilt the whole body gets spoilt and that is the heart. "I asked Allah that my nation (the Muslims) would not be destroyed by being out numbered. And Allah granted that prayer. I then asked Allah that my nation (Muslims) would not be destroyed from poverty. And Allah granted that prayer. I asked Allah that my nation (Muslims) would not be destroyed by being divided and fighting amongst themselves. Allah did not grant that prayer." Notice, he said the "saved sect" would be those who remained on what he and his companions were on, meaning, "Quran and Sunnah." We see clearly from the above that Allah Subhanahu wa Ta'ala has named us as "Muslims" alone. Additionally, when we consider that the deviant groups always have to have a name of some kind in order to distinguish themselves from the others, we begin to see the pattern. If someone feels that it is necessary to describe himself as a certain kind of "Muslim" then this is his or her problem. Now of course one could say that: "I am a tall Muslim." or "He is a small Muslim." and then this type of description is for the purpose of identifying physical characteristics. Additionally, a person might use someone's country or nationality to describe a Muslim for the purpose of determining their heritage such as a "Pakistani Muslim" or an "Arab Muslim." These types of descriptions do not put a person out of the fold of Islam. Where the problem comes in is when the adjective related to the word "Muslim" or the word "Islam" has to do with FAITH or BELIEF. We must understand that Allah Subhannah wa Ta'ala has made it perfectly clear both in the Quran and in the sayings of the Holy Prophet, peace be upon him, that the religion of Islam was perfected and completed during the lifetime of the Prophet, peace be upon him, and that no new religion would come until the Last Day and that those who followed Islam were called by Allah, MUSLIMS. In one hadeeth of the prophet, peace be upon him, drew a straight line in the dirt with a stick. He said, "This is the straight path to Allah [meaning the Way of Islam]." Then he drew angles right and left off of the straight line and said, "These are the deviant groups (or sects of Islam) and each one has a devil calling to it." He mentioned that there would always be a main body of Muslims who would be on the straight path until the Last Day. "On this day have I perfected your way of life (sometimes translated as [religion]) for you, completed My Favor upon you and have chosen for you ISLAM as your way of life." Sheikh Mohammad Jibaly, a learned teacher of Islam, mentioned a hadeeth of the prophet, peace be upon him, to me some time back, wherein the prophet, peace be upon him tells us it is forbidden for us until the Last Day to call ourselves by any names except "Abdullah, Abdur Rahman and Muslim." These words should have a profound impact on the believers today as much or more that those who heard them one thousand four hundred years ago. Today more than ever before we have seen what these names and groups have produced in the way of division, hated and violence. Once there was a community of Muslims who were small in number yet large in belief and strong in action. So much so that, the non-believers could not defeat them in battle even though they had the Muslims out numbered. One day a young man from the enemies pretended to enter into Islam and he went to the big teacher [learned man] in one part of the city and listened to his teaching of the Quran. The subject happened to be on the chapter of the Quran called Al Kahaf [The Cave, - #18]. “No.” replied the old teacher, “It was definitely YELLOW.” Once again the young man thanked him and when on his way. The next night the young enemy acting as though we was still seeking knowledge went to the other side of town and sat in another gathering of knowledge and they too were discussing different things about verses in the Quran. “Thank you, sir." said the non-believer. The next night the non-believer still posing as a Muslim went back to the first teacher and then when it came time for the questions and answers he raised his hand and asked, “Teacher, you have so much knowledge and I am only a small beginner, I was just wondering, could you maybe remind me about the answer to the question the other night about the color of the dog in the cave in Surah Al-Kahaf?” (Quran: Chapter 18). Now the next time the enemy went to the teacher who believed the dog was BLACK, he told the teacher that the teacher on the other side of town was calling him names and saying that he had no knowledge of Islam and that for sure that the dog was YELLOW. The plan was working. Before long the community was divided into two groups. Each group was claiming that their teacher was the one with the correct answer. Fighting broke out in the streets and the Muslims began attacking each other all over the city. Everyone became involved to the extent that there was not a single person who was excluded from this terrible situation. Screaming, shouting, hitting and fighting were everywhere. And then it happened. The kafr went back out to his people and told them, “Let us go to fight them now. You will now find them most easy to defeat." May Allah save us from such fitnah [tribulations]. Ameen. We ask Allah to make us as one body joined together for all that is good in Islam, ameen. And may Allah make us avoid at all costs, the dividing and the separating of the real "Muslims." Ameen. For solutions to problems of division amongst Muslims, visit the article listed below. Who Do We Trust For Correct Knowledge? How Can We Save Ourselves From Destruction? If you would like more information on this subject, please do not hesitate to write me. If I have made any errors then please advise me and ask Allah to guide me to do better.